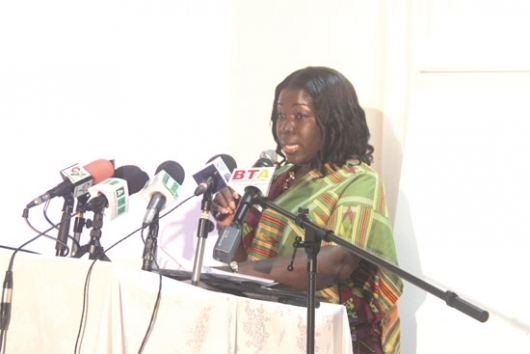 Mrs Elizabeth Ofosu-Adjare delivering her speech during the stakeholders’ meeting on Domestic Tourism Project at a ceremony in Accra. Not to be left out, the major private media TV station JOY NEWS carried the story yesterday April 1st, more than two weeks after the event. COULD IT BE THEIR APRIL FOOL’S. A clip from the March 13th event of the Minister of Tourism describing the promotion campaign was shown back to back with the item announcing the drastic 7.6% rise in fuel prices here in Ghana. Anyways, fuel isn’t all that has been going up DRAMATICALLY! ELECTRICITY PRICES – UP A CUMULATIVE 93% IN 5 MONTHS; WATER PRICES – UP A CUMULATIVE 13% IN THE SAME TIME, FUEL PRICES – UP 32% IN 3 MONTHS, TRANSPORT PRICES – UP 60 TO 100% THIS YEAR. And there’s the Minister of Tourism, like a Sunday school teacher, talking about targeting various attractions around the country and organizing excursions…. GAWD! I hope no revenues from the 1% tourism levy fund such photo opts of connected families or schools travelling to tourist attractions on the taxpayers’ dime!!! Ugh…but who else will be able to participate in domestic tourism???? Who in heaven’s name in Ghana has any foreign exchange and even if you do, you have to prove to your bankers that you are travelling OUTSIDE the country in order to withdraw any! But, let me leave you with a question….why isn’t the Ministry of Tourism focusing on international leisure tourism??? The cedi is down, there was worldwide exposure of Ghana’s great tourism product on CNN, peace and stability reign here in Ghana,….oh you add to the reasons why Ghana must get her priorities right….